Schools are out, the weather is almost predictably warm, campers can be seen driving down the roads, humidity rules the day, and there’s a massive amount of road construction. Looks like summer has finally come to Midland, Michigan! Along with all the other fun opportunities of the season, summer can’t really be complete without some bargain shopping at yard sales. I can’t say no to cheap books, after all, and you never know when you might find a true gem in the midst of all the dusty merchandise. * Each sign must list the owner’s name and address. 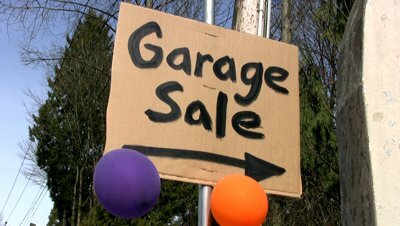 Rummage/yard sale sign regulation violations may result in a warning or a civil infraction citation. I can understand and stand behind some of these rules. For example, it only makes sense to have your name and address on your sign, and you should probably ask someone before putting a sign on their property. Having a garage sale is like starting a very short-lived business. As the one in charge of this business, I’m also in charge of making executive decisions. Maybe I want to have the sale on Tuesday because I’m trying to differentiate my sale from all the other sales that happen on the weekends. The city government says I can’t have it on Tuesday; I can only do it from Thursday to Monday. You might say that it doesn’t matter; having a weekday sale is a stupid idea, since most people would go to garage sales on the weekend, but not during the week. I say: so what? If I want to make risky business decisions, I should be able to. That’s part of being an entrepreneur. I’m allowed to make my own mistakes. It’s not the city government’s job to make sure that my sales are up. Allowing citizens to make their own business decisions should be the default, and it should be up to the city government to show why yard sales can only be on weekends. Even if I was going to submit and have my sale when everyone else has theirs, I would lose the competitive advantage of having a cool sign, since mine can’t have flags or balloons. Mine also can’t be more than 30” above the crown of the road. The crown of the road is where the road curves so that water always runs into the drains. This rule means that the top of my sign can’t be 30” higher than the top of the curve. Speaking of which, how would you even measure that? I can understand measuring from the side of the road, but how am I expected to know how tall the crown is? Tape measure? Laser level? Yard stick? All three, in some convoluted process? Somehow, I think my attempts to find out how tall this road crown is would obstruct traffic more than my sign would. Even more ridiculous than this is the fact that the citizens of Midland had to contact and work with the City Council to get the rules this lenient. Before October of 2006, the Council didn’t want any yard sales at all, lest people think that Midland is a dirty town with people who would rather sell their things than throw them away. The only signs that are specifically allowed under the Code of Ordinances Section 22-2(a) are the parade of homes, and, thanks to the citizens, yard sale signs. Let’s stop and think about these rules a minute: how many graduation open house signs have you seen, and how many of them have had balloons? I’ve seen at least twelve signs, and at least three of them have been sporting balloons. Yet, no provision was made for open house signs, and the balloons are blatantly disregarding the standards that all civilized sign-makers should abide by. Somehow, my classmates and their rowdy open house signs have managed to evade the long-fingered reach of the law and get away without civil infractions. Are my classmates brilliant at escaping justice? No, they didn’t even need to try. In other words, no one enforces these laws. Who can blame them? If an officer stopped for every grad party, he’d never be able to do his actual job. It would be extremely difficult, too, for a police officer to drive by someone’s yard sale sign and immediately be able to tell if it was over 6 square feet, or 30” above the crown of the road. I understand that the City of Midland wants the city to look nice and orderly, which is what they were trying to do with these laws, but this is not the way to go. If they’re not going to enforce these frankly ridiculous sign regulations, then they shouldn’t expect people to abide by them. Forget about the sign thing and focus on more important issues. Let the citizens of Midland embrace their rebellious natures and have their yard sales on a Tuesday. Maybe they can even throw in some balloons, too. I believe the crown of the road is in the middle of the road. So yes, you would have to rent surveyor’s equipment to determine the height of the road since you surely don’t want to run a line from the crown of the road to the side of the road.